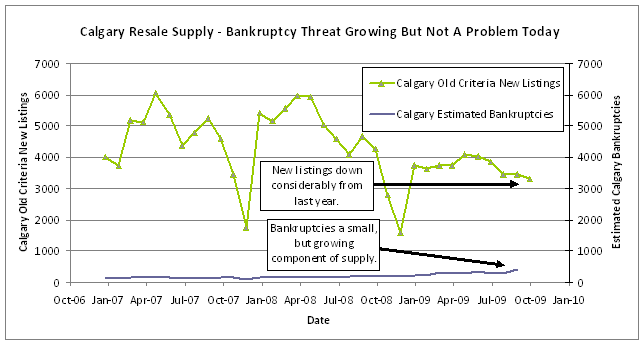 Posted by DustinRJay in bankruptcies, Calgary real estate, foreclosures. Much has been said about the growing amount of mortgage arrears in Alberta, but how much does that impact supply? As shown in previous graphs on this blog, the resale market has generally been rising whenever sales\new listings is greater than 50%. Given that Calgary condo and single family home average resale prices has risen over the last year, the supply\demand situation has obviously shifted to create stability in the market. Most Calgarians know by now that mortgage arrears and bankruptcies are up. And most Calgarians I believe may think that the correction was due to the increase in bankruptcies. This couldn’t be farther from the truth. 2009 was a year that had a lot less new listings than in 2007, and 2008. So even while bankruptcies have increased, supply is down measurably as well. Supply due to bankruptcies remains a fairly small contributor to the overall resale supply picture. One of the problems that caused the initial correction, was not a vast increase in bankruptcies, but that supply levels during the correction period were much greater than demand. Resale supply can come from many sources including death, divorce, and job transfer, but also low rental yields and offloading by investors, new housing construction and speculation of a market downturn. Alberta bankruptcies are likely to continue to increase into 2010 (2.7 times January 2007 filings), as the rising mortgage arrears (4.2 times January 2007 amounts) have shown that banks have a bit of a backlog of mortgage arrears to clear out. Banks and the CMHC should communicate to developers and other market participants to expect more supply from mortgage arrears turning to bankruptcies going forward. The following graph shows an estimate of Calgary consumer bankruptcies (estimated as 33.5% of the total Alberta population when compared to the Calgary CMA which includes the towns of Airdrie, and Cochrane in addition). Note that bankruptcies also include mortgages, bank and company loans, credit cards, taxes, student loans and utilities. In 2006, mortgages were declared as a liability in a bankruptcy only 17.5% of the time. Therefore, I believe the bankruptcy estimate as a component of new listings is a more pessimistic guess than actuality. One also needs to consider that bankruptcy filings have not kept up with mortgage arrears, and this may be because the judicial and banking system is in the process of staffing up to deal with a higher volumes as compared to the cylical lows in mortgage arrears that occurred in mid-2007. Please vote below and feel free to elaborate on those risks further in the above comment section! Posted by DustinRJay in Calgary real estate, mortgages, Uncategorized. The cyclical average for mortgage arrears in Alberta has been about 0.4%. 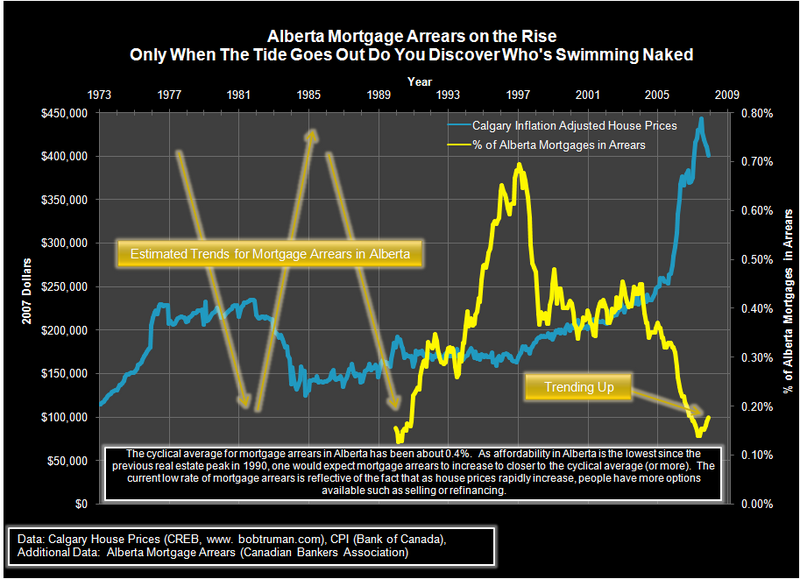 As affordability in Alberta is the poorest since the previous real estate peak in 1990, one would expect mortgage arrears to increase to closer to the cyclical average (or more). The current low rate of mortgage arrears is reflective of the fact that as house prices rapidly increase, people have more options available such as selling or refinancing. As time passes, and more people have purchased properties that they can marginally afford and/or poorer economic conditions develops, the amount of mortgages arrears will increase. Credit risk typically appears after house prices have stagnated or begun to fall. I would highly recommend to compare this graph with Mohican’s at Langley Financial Planning and Personal Sanity who originally posted a similar mortgage arrears analysis for British Columbia. As for timing real estate transactions, it is good investment advice to be, “fearful when others are greedy, and be greedy when others are fearful.” Look to mortgage arrears for help in timing peaks and troughs, as high amounts of mortgage arrears can indicate a good time to buy, whereas low amounts of mortgage arrears can indicate a good time to sell. More specifically, trend direction changes in mortgage arrears from cyclical highs or lows can indicate an inflection point in the real estate cycle.